Judges Madisen Law, left, and Sarah Thul study Nathan Penn's entry into the McLean County 4-H Show's Lego competition. If you haven't been to the McLean County Fair's 4-H Show in a few years, you might be surprised. It's long been associated with things like livestock and traditional pastimes like baking and quilting. But as GLT's Eric Stock found out when he served as a judge, organizers of 4-H in McLean County have moved into the 21st century in hopes of staying relevant. Once you walk past the roosters and then file past the horses and all the other animals on display on the Interstate Center grounds in Bloomington, you get to the giant pole barn dubbed Cloverleaf Auditorium. That is headquarters for the 4-H Show. Inside is a maze of young people, many of them with their parents, all hustling in a controlled chaos to get from one 4-H contest to the next. Many of them are in half-dozen competitions or more in a single day. There's the traditional programs like gardening and quilting and woodworking. But there's also several newer contests designed to capture the attention of today's tech-savvy youth. 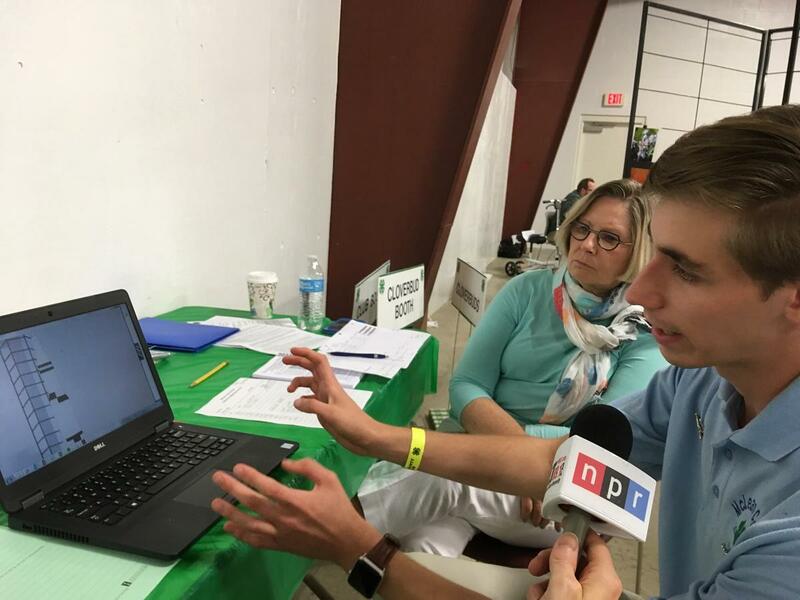 Tristan Friedrich explains his entry in video production at the McLean County 4-H Show as judge Irene Denbesten looks on. One such contest this reporter judged is animated video production. Tristan Friedrich, 17, of Bloomington, described the video he produced. Tristan made two animated videos which he said took more than a month to produce. He doesn't plan animated or video production as a career, but figures he still picked up some life lessons along the way. One of the other contestants hopes to use his video production skills to make music videos someday. Wyatt Lopez, 16, of Heyworth, who is also homeschooled, produced a video which plays off what he calls the "frat boy stereotype." He has an older brother who attends Illinois State University. One scene shows two male students trying to push open a door to one of the buildings on campus, while a classmate walks up and easily pulls open the door. Wyatt added live action, however, poses its own challenges. Video and filmmaking are just two of a host of new categories 4-H had added in recent years to better connect with today's post-millenials, or what some call the iGeneration as in iPhone, children who don't know a world without smartphones. Bobbie Lewis-Sibley is the University of Illinois Extension director for McLean, Livingston and Woodford counties, which puts on the annual 4-H show. She said the fair has to adapt to what young people want, even if it's at the expense of more traditional programs. 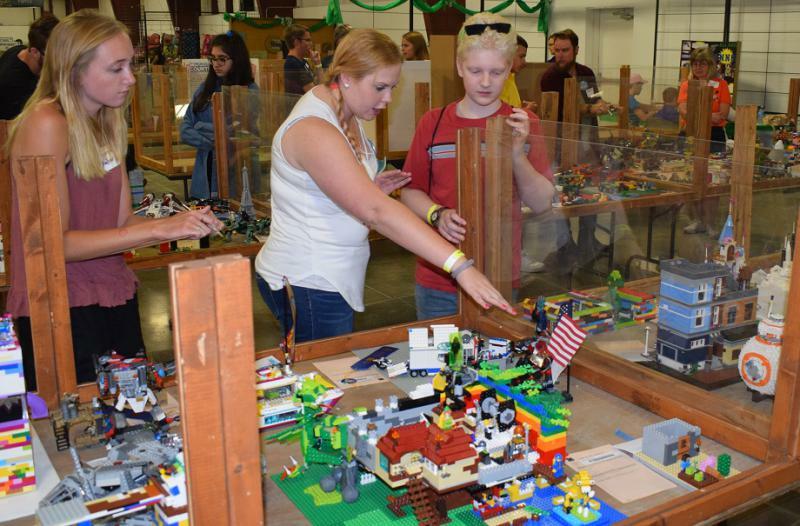 Another recent addition to the 4-H fair are Legos. Students use Lego pieces to create intricate automobiles, ships, castles and whatever else indulges their imagination. Sarah Thul has been judging for three years. She said the Lego players of today may well become the builders of tomorrow. 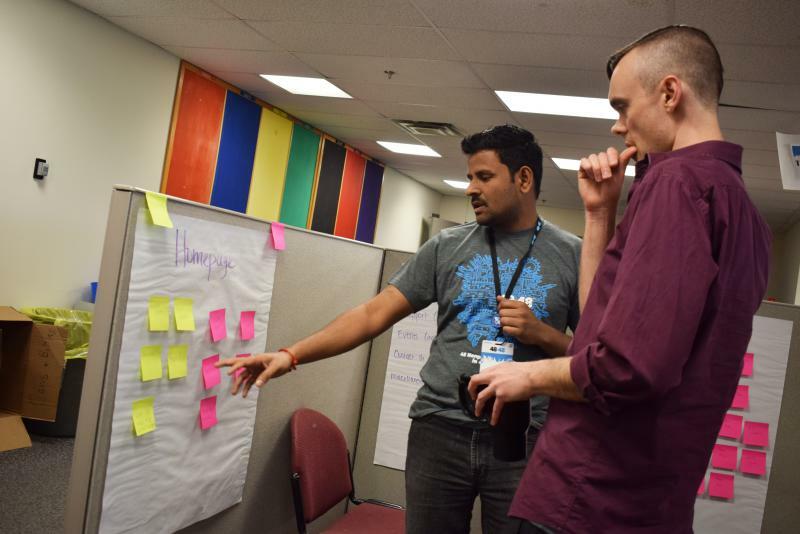 “It takes a lot of creativity and a lot of problem solving,” Thul said. “There’s construction involved. You’ve got to find the right Lego pieces. There are a lot of intricate pieces. Students can also try their hand at computer programming. Chris Miller has been judging the students' computer skills for five years. “I’ll be honest, (these are) really good programs,” Miller said of the student’s work. “I’m kind of impressed knowing that the younger generations are coming up and being strong in programming. While the students tend to go at their own pace—there's no school grade after all—Miller and fellow judge Renee Collins say those who participate are getting an all-important education outside the classroom, whether they realize it or not. “It’s nice to get that learning done and that education done now when it’s something that they are interested in as opposed to being forced to do something later that they don’t really want to learn,” Miller said. “(It’s) school versus fun,” Collins added. 4-H is looking to further its direction into the future with what it calls a STEAM Day it will host Saturday. STEAM in this case stands for Science, Technology, Engineering, Arts or Ag, and Math. Emily Saddler runs the STEAM program for the Extension office. She said the event was for kids of all ages to watch and take part in technology demonstrations. Lewis-Sibley said not all traditional programs are going the way of the dodo bird. For example, she said several years ago organizers considered dropping beekeeping because of a lack of entries. Since then, there's been an apparent resurgence in beekeeping amid concerns about honeybees dying and the impact on honey production and crop pollination. Now, 4-H has more than enough entries for beekeeping. 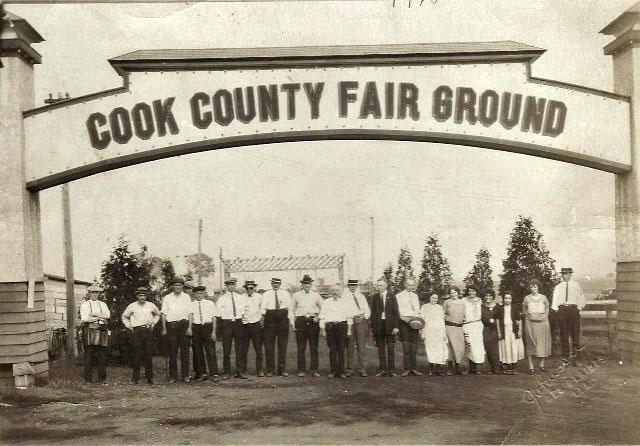 For those who see the 4-H fair as one of the few remaining links to the area's rich agricultural history, Lewis-Sibley said change can be difficult. The fair wraps up Sunday in Bloomington. The best 4-H entries will have a chance to compete for Best of Show at the Illinois State Fair which begins Friday in Springfield. How badly did the Community Health Care Clinic need a new website? Amanda Jensen was on Facebook one afternoon when she saw her friend post one of those “look at me!” photos. But her friend wasn’t running a marathon or on an exotic vacation, her friend was winning first prize for sewing at the Cassia County Fair in Idaho. Amanda wanted to win something, too, and then she remembered she had her mother-in-law’s chocolate chip cookie recipe. If she could enter those cookies at a county fair ... a blue ribbon would be hers. After Tesla Crash, Will Driverless Technology Transition Slow?